Kimi's travels: Departing for a voyage around the world! Departing for a voyage around the world! They will be posted toward the bottom of the page. 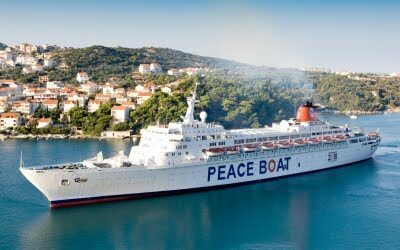 In addition, I will update Peace Boat's Facebook page every few days, so if you would like to see where I am and what I am doing, "like" Peace Boat on Facebook. Let me know if you don't find it and would like me to send you an invitation. Aside from my duties as a web reporter, I will have limited internet access during the voyage. I will post a blog entry from time to time at http://travelingkimi.blogspot.com/, which will be automatically posted on Facebook, but aside from that my use of Facebook will be very limited, so please contact me by email, and don't be surprised if it takes me awhile to answer. I'll try to check in about once a week. Nonetheless, I look forward to hearing from you! I will return to Japan on April 18.